Outstanding contributions to science have been recognised by the Australian Academy of Science with 18 of Australia’s leading scientists and future superstars receiving prestigious 2018 honorific awards. MICCN’s Associate Professor Alexander Fornito was among those recognised, being the proud recipient of the 2018 Gottschalk Medal. 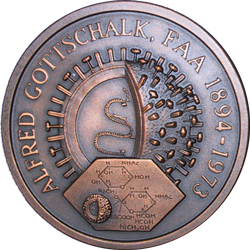 The Gottschalk Medal recognises the contributions to science by the late Professor A Gottschalk, FAA, through outstanding research in the medical sciences by researchers up to 10 years post-PhD in the calendar year of nomination. Associate Professor Fornito was awarded for his work in interpreting how disruptions of brain connectivity can lead to mental illness. “We use brain imaging techniques such as magnetic resonance imaging, in combination with mathematical modelling, molecular genetics and psychological assessments, to understand how the brain works in both health and disease,” Associate Professor Fornito said. “A major focus of our work is on understanding how the brain functions as an integrated network. We develop new tools for mapping brain network connectivity and we use these tools to chart how brain dynamics respond to different cognitive challenges; to characterise how genes influence the large-scale organisation of brain networks; and to map how brain connectivity is disrupted by mental illness. President of the Academy of Science, Professor Andrew Holmes, congratulated all the award winners for their inspiring research. “Research by this year’s awardees is addressing some of society’s biggest challenges and also changing the world for the better. It is absolutely crucial that we continue to recognise and support their outstanding contributions so that people continue to be reminded of the important role of science for humankind,” Professor Holmes said. MICCN congratulates Associate Professor Fornito on his achievement. More information on the other outstanding contributions to science can be found here.